Forged knives are my favorite type of knives and I have been using more than 100 different models. The last one is a bit different and I personally believe a bit better than the competition. The model in question is the Mercer Culinary Genesis 8 Inches Chef’s Knife and it is very popular at this moment. The blade is the basic part of any knife. In this case, you will get the forged blade, made from German stainless steel. It means that it is resistant to corrosion, it won’t change color over the years and it is impossible to break it. According to several tests, this blade is unbreakable and far better than most models have to offer, especially those from the same price range. The blade is also important to the balance. In this case, the manufacturer used the ‘’whole length’’ construction, which means that the blade and the handle are perfectly paired, in order to users get the highest level of balance. As the end result, cutting is simpler and it won’t cause wrist fatigue. It also means that the cutting off hard food is simpler and requires less effort than ever before. 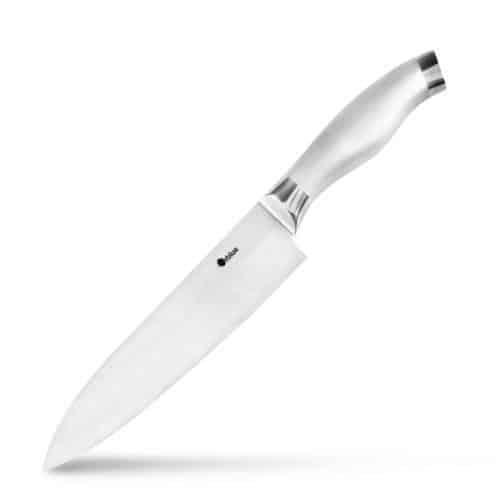 The handle of the Mercer Culinary Genesis 8 Inches Chef’s Knife must be mentioned. It is made from a special type of material that offers a perfect balance between the quality, durability, and low weight. The end result is phenomenal. The handle is very comfortable to use, even with wet hands, it is resistant to minor damages and it can withstand low and high temperatures. All of this means that cutting and using the knife us simpler, but the maintenance is much simpler as well. Washing in a dishwasher is possible, thanks to this handle. The most important fact is that the handle will stay in perfect condition after many years of use, simply because the material is resistant to almost anything. Detergents and kitchen oils cannot damage it, so it will be useful for many years to come. 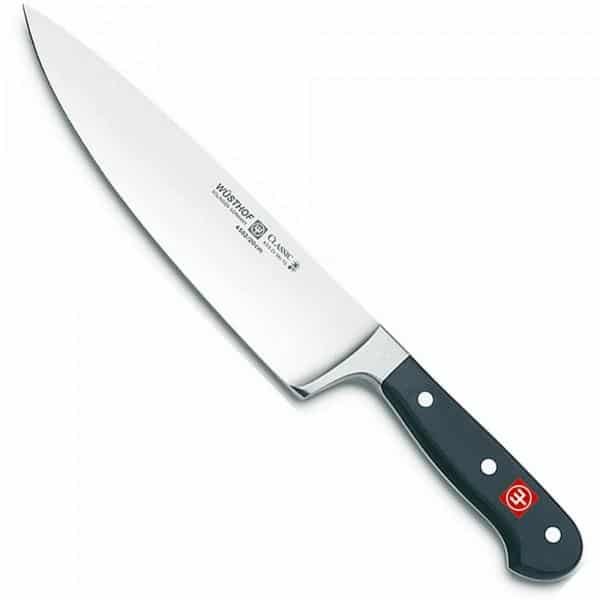 One of the most important advantages the Mercer Culinary Genesis 8 Inches Chef’s Knife has, is the weight. 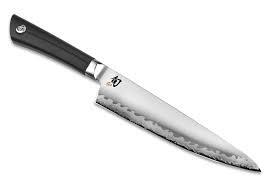 In fact, this knife is lighter than any other models from this class. The weight is 1 pound, but keep in mind that this is an 8 inch knife that has been made from forged stainless steel. There is no point of saying that the low weight makes using the knife for a long period of time simpler and better. Chefs are more than satisfied with this feature and it is one of the most important reasons, why this model is so popular among professional chefs, across the planet. Don’t think that the durability of the knife has been compromised, due to a low weight. In fact, this is still one of the strongest knives. The handle and the low weight are something that makes the Mercer Culinary Genesis 8 Inches Chef’s Knife different than other models. It has 4.8 out of 5 star rating, which is very high. The Mercer Culinary Genesis 8 Inches Chef’s Knife is a durable, well-balanced and lightweight and a sharp knife, designed for professional chefs. It is probably one of the safest choices you can make right now and it is the best selling model in the class. If you are looking for a great knife, this model should be on your list, simply because it is worth of every penny.